Screen printing is a stencil method of print making in which a design is imposed on a screen of polyester or other fine mesh. A screen is created for every print color, and each screen is coated with a photosensitive emulsion. The image is then transferred onto the screen by way of blocking the light exposure to the photosensitive emulsion using a high density film. The area that is not exposed by the exposure light will then rinse clean with water, leaving the screen mesh in the shape of the image. 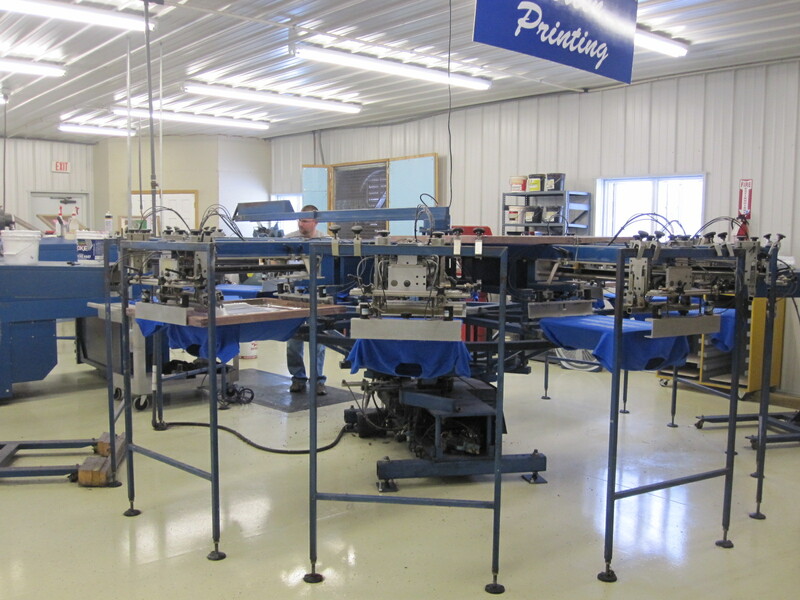 A press is then set up with multiple screens as needed, registered by way of test print. The product is then printed on by either manual or automatic method, using a squeegee to transfer the ink onto the product. The product then passes through a flash curing unit, or onto the next print color, and so on until the correct image is achieved. Plastisols are the most commonly used inks for printing designs on to garments, and are particularly useful for printing opaque graphics on dark fabrics. The ink is composed of PVC particles suspended in a plasticizing emulsion, and will not dry if left in the screen for extended periods. Plastisol inks are recommended for printing on colored fabric. On lighter fabric, plastisol is extremely opaque and can retain a bright image for many years with proper care. Silicone offers an alternative to the usual Plastisol inks. Silicone is best known for being soft to the touch and stretch-able. Especially on polyester items and athletic wear, silicone is the way to go. We are one of a handful of shops that use this type of ink due to it’s difficulty to work with and store. Ask to see our samples of silicone inks in our showroom today! Due to the increased labor and waste for this ink, there will be a slight upcharge for using it. Soft Inks are still plastisol inks, but are wildly different in color and texture. Soft Inks “blend” into the fabric instead of sitting on top like traditional plastisol. They also blend with the color of the garment, creating a much more subtle color combination. For example, if you printed white soft ink on a red shirt, the design would appear pink. Water based inks are perfect for the soft touch that is in high demand today. We are in process of testing and fine tuning our use of water based inks. Our Screen Printing department operates a variety of printing presses to meet your needs. 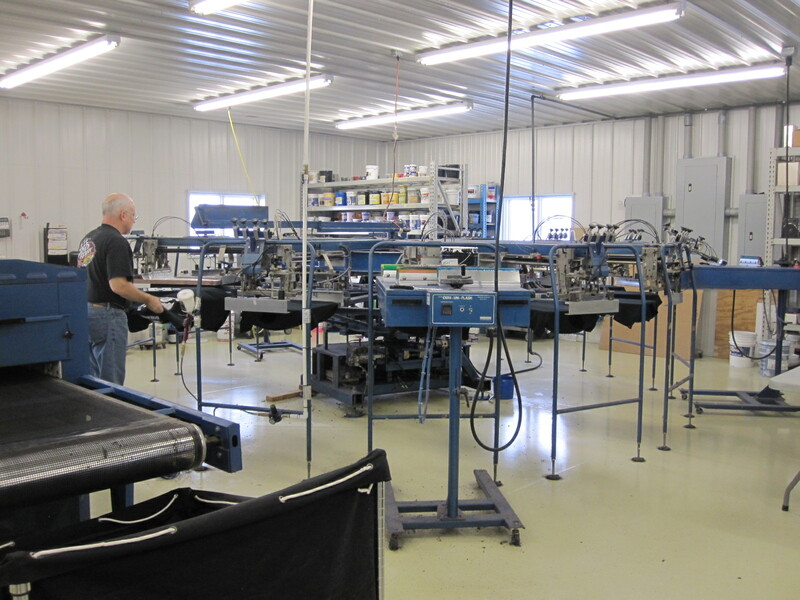 All screen printing is done in house in Marion, Indiana. We have 3 automatic screen printing machines and 1 manual, with a total of 38 heads. We create multi-color, multi-location prints in both small and large quantities. We can screen print 400 shirts per hour! Our newest press is a M&R Sportsman EXG automatic screen printing press. It is exceptionally fast, with a larger (20” x 20″) maximum image area, and compact footprint. It allows us to print multi-color jobs with better quality and speed.